Thank you so much Elias ! Very nice B&W work dear Armando. Great light, perspective and composition. Thanks alot dear Sofia ! I'm so happy querida Malules ! You are welcome dear friend Mustafa . Thanks alot for stopping on. Hi my sweet Srna ! you are welcome , and thanks alot for stopping on. You are welcome dear Carol ! congrats on the well deserved award, dear Armando. Many thanks for your double comment on my pic. You are always so kind to stop on my portfolio. You are welcome friend Saad ! It is a honor for me to be commented by you ! Many thanks for your kind words on my pic. Thanks alot for your kind comment. Thanks alot dear txules . Ormai tu sei abituato ai premi sulle tue stupende foto. Ti ringrazio del commento . Lovely play of light and shadow, what a symetry! So well composed shot in fine tones; congrats for the award! more than well deserved award!!!! woooow che toni e che effetto... complimenti.. finalmente un premio! like it a lot dear Armando!!! 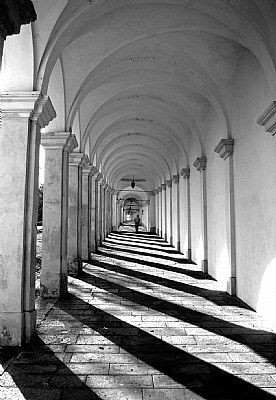 Well done perspective shot, Armando, and very good b/w tones!